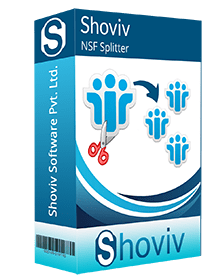 Shoviv NSF Splitter is a comprehensive solution which works for splitting large NSF files into multiple pieces of NSF files without changing their properties. The tool contains three different and special modes to work so that NSF files can be managed accordingly to split them. 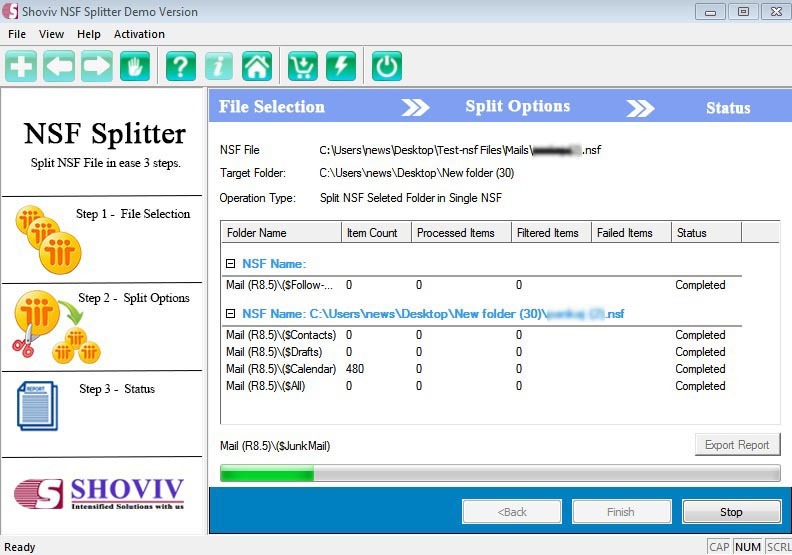 The free version of the NSF Split software permits users to break first 25 items/emails of selected NSF folder(s). 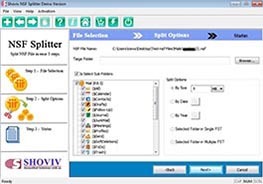 With this users can understand how the software works to split NSF files and folders. Afterwards, a step to purchase the software can be taken. 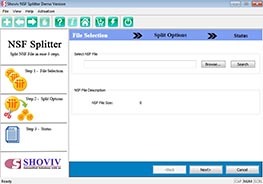 *Free Download allows to convert & save 25 items/folder from NSF Splitter. This is a professional tool which works to reduce NSF database with the easy process to split contacts, emails, and archive emails. 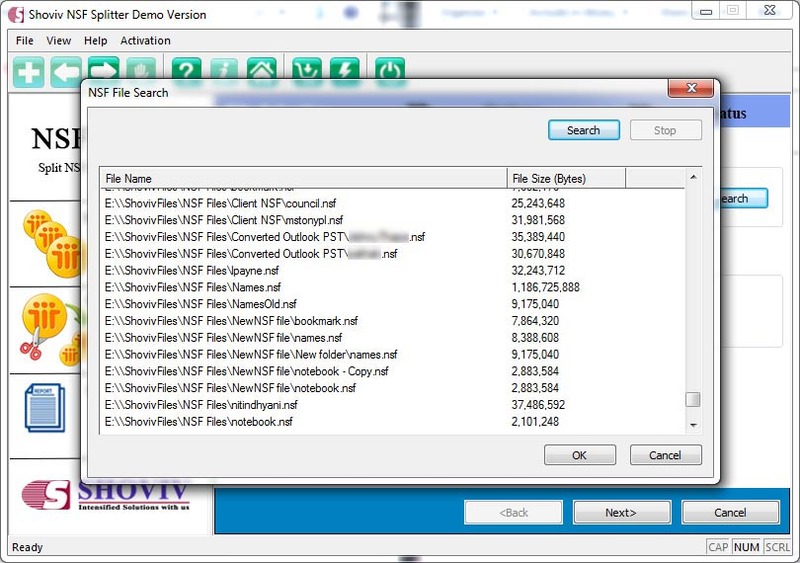 It can be easily used to reduce the NSF files into different sub files of various sizes. This tool will not alter any bit of data once the process to split NSF files gets completed. No matter it is the process to split NSF emails or contacts, the chances of changes in original data is nil, it keeps the data original. There are three ways to break the huge size NSF files into different parts. 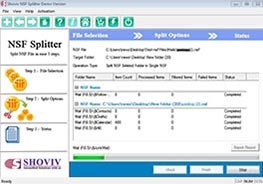 Users those are willing to divide NSF files into pieces can opt the one from options enlisted as “Split NSF File by Sender email ID”, “Split NSF File by Size,” or “Split NSF File by Date”. This mode of the tool helps users to divide the NSF files as per the size defined. Let’s say, user wants 50 MB NSF files and having 150 MB NSF file then, the process will divide the 150 MB file in three files of similar size. Under this option, the users need to check all those email ids from where the emails are received and the splitting has to be done. The new NSF files after splitting will contain all the emails and contacts from the email ids selected. The software is very constructive and executes the NSF split operation in very safe manner so that entire data will be preserved. The software widely supports to generate the unchanged data in NSF files after splitting. All user defined and selected NSF folders will be converted into separate NSF files. The entire data of those NSF folders will remain same and preserved once the NSF files are being created. 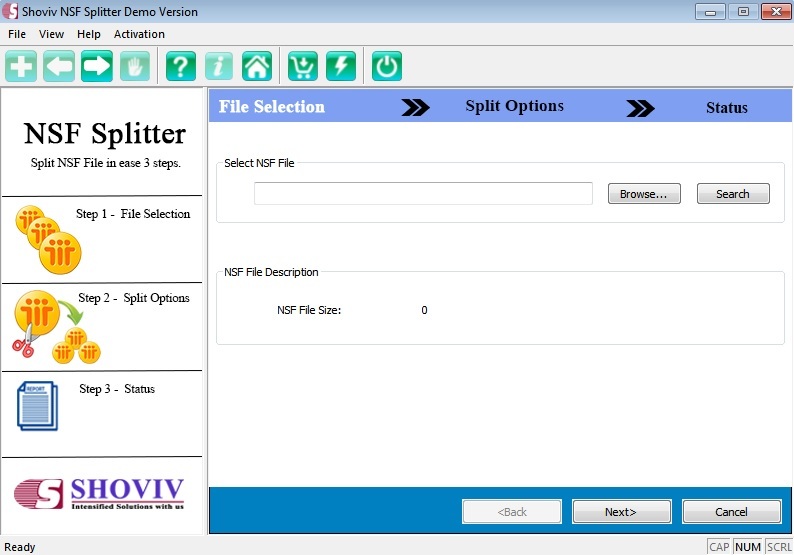 For selected NSF folders, one NSF file can be created with the use of NSF Split tool. The NSF file generated by the tool will be saved at the desired location of the user without any hassle. Why NSF files needs to divide/split? Oversized NSF file becomes a factor of Data corruption, slow performance of the Lotus Notes, unfortunate data deletion, emergent deletion etc. That’s why one need to split large size NSF file. What is the way to divide NSF file? This tool comes with 4 ways of splitting NSF file. You can split file according to a time span, according to the size given to create new NSF files, according to the chosen email id, or by creating single/multiple files afterward NSF division. Is there any limitation for file size to split? No, there is no limitation to split NSF files. 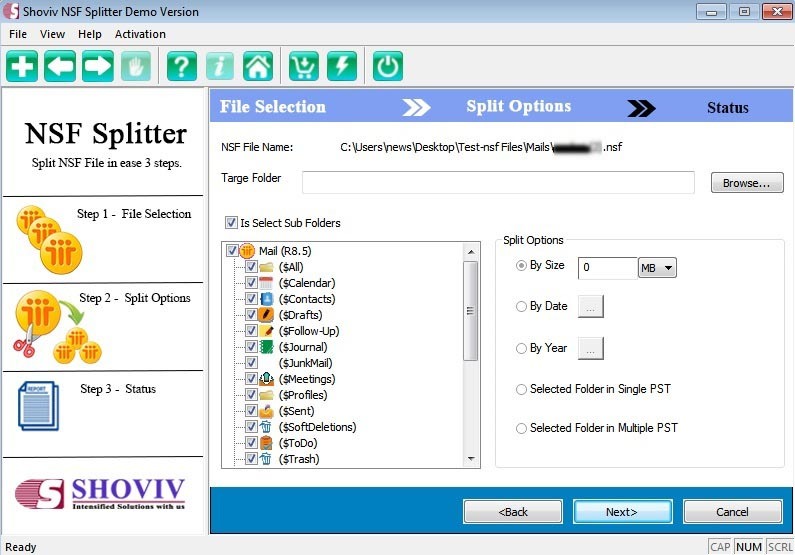 You can use Shoviv NSF Splitter software to split and divide any NSF file into multiple NSF files of any selected size. Will this tool work for damaged and corrupt NSF files? 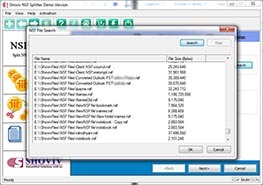 This tool doesn’t repair damaged or corrupt NSF file. But you can do it try our repair Software.